We've not seen much of the reboot of the cult British show Thunderbirds outside of a small teaser and the soulless void that is the new look International Rescue - but what about the Thunderbirds themselves, the actual vehicles? Here's our first good look at them in Toy form, thanks to London Toy fair. For readers unfamiliar with the series, Tracy Island was the home base of the Tracy brothers and their friends as part of the show's team, International Rescue. It was basically like something out of a Bond film - both excruciatingly 60's-stylish and filled with wonderful gadgets, including the Thunderbirds themselves. But people might remember it more of the AMAZING playset that was released 1992, after the series had a surge in popularity again from being repeated on the BBC. People went insane - the sellouts were so infamous that in the British toy industry the release is still a prime example of exactly what not to do with the launch of a toy in a run up to Christmas. People were so desperate that the BBC kids show Blue Peter, known for its arts and crafts projects, ran a now-iconic segment on how to make your own with household materials, and viewers swarmed the BBC trying to get access to the instruction sheet to make it. I still have my Tracy Island playset in the house somewhere, and although this new one comes with fancy lights and sounds and what have you, it's still an incredible toy. Gone are the sleek curves of the 60's original, with the addition of folding wings and a much blockier, militaristic look. Like wise, Thunderbird 4 is looking a bit more compact and angular too. 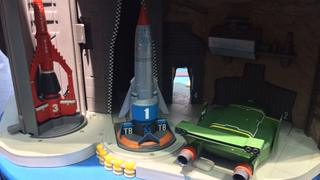 It seems like a weird choice to stay so familiar with the first two Thunderbirds, but then change it up more for Thunderbird 2. But still, they all look pretty great, and largely faithful to the original supermarionation show. Huzzah! Now all the show needs to do is keep the theme tune as rad as ever. Check out plenty more pictures at the link below!